The TFS Community naturally tends to have similar opinions on many teams and players in basketball. At Hoop Vision, there are certain types of teams we enjoy to watch and follow. 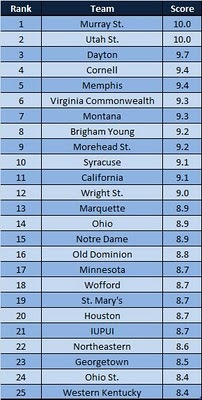 The top 25 we put together in this post is not the best 25 teams in NCAAB. The idea was borrowed from a Carson Cistulli post at Fangraphs. He introduced a stat for baseball pitchers called NERD (comprised of qualities that stat geeks tend to like). We tried to do that in this top 25. This top 25 is from the 2009-2010 season. Note: The offense and defense components are pretty arbitrary. It is what we favor, but can definitely be ambiguous. This chart as well as charts for the top three teams in each conference can be found on its own page. You can go there by clicking on the “Hoop Vision Top 25 (2009-2010)” tab at the top of the website.